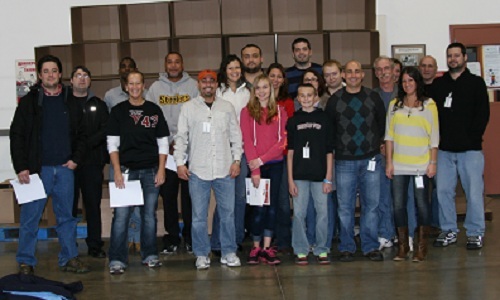 On Friday, November 2, 2012, nearly 20 employees from VoIP Innovations', a wholesale VoIP provider, spent the afternoon at The Greater Pittsburgh Community Food Bank. This particular Food Bank distributes 2.2 million pounds of groceries a month, so they rely heavily on volunteers to help with packaging. The ABG Capital team worked in the Repack Center of the Food Bank and helped package up hundreds of pounds of frozen meat, poultry, and seafood items that were donated from local grocery stores. Located in Pittsburgh, PA, ABG Capital leverages its unique business management model to reduce costs through the consolidation of back office operations for its portfolio companies. By consolidating services like accounting, legal, IT, software development, Employees administration and HR, ABG Capital is able to eliminate redundancy among our portfolio companies and increase efficiency. To learn more about ABG Capital, visit them at http://www.abgcapital.com or 866-912-6335. VoIP Innovations is a portfolio company of ABG Capital. They are a wholesale VoIP provider to Carriers, ITSP’s, Calling Centers, Calling Card Companies and SMB/Enterprise. These services include VoIP Origination, Termination, 411, e911, Caller ID and more. To learn more about VoIP Innovations, visit them at http://www.VoIPInnovations.com or 877-478-6471.